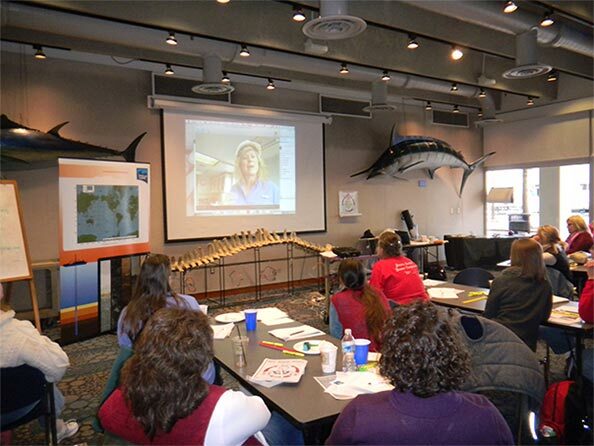 Teresa Greely connected with 30 teachers at the New England Aquarium via Skype. Greely was on the deck of the JOIDES Resolution, pointing out the volcano on Montserrat and explaining the science mission of Expedition 340. The teachers were part of a Deep Earth Academy professional development in New England. Print article This entry was posted by Charlotte Koh on March 15, 2012 at 2:34 pm, and is filed under Oceanic Updates. Follow any responses to this post through RSS 2.0. You can leave a response or trackback from your own site.